If you've ever wanted to learn how to make hurricane candles, you'll be pleased to discover that they're quite simple to create. Hurricane candles are perfect for indoor or outdoor use, and can be embellished with all kinds of decorative materials. 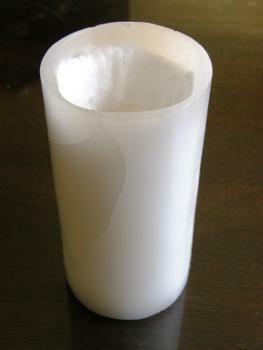 Hurricane candles are large candle holders that are made of wax, and use a small votive candle inside for illumination. The combination of a thick wax shell and a lit candle inside provides a lovely warm glow. Hurricane holders are normally made with plain white wax, though you can add a hint of color if desired. Making hurricane candles allows you to customize the shells by adding embedded objects to personalize them. These instructions will guide you through the basics of how to make hurricane candles, resulting in a plain, unadorned shell. The most important thing to keep in mind is that you need a good quality paraffin wax, with a high melting point. If you opt for a cheaper, lower quality wax, you'll end up with a hot, gooey fire hazard instead of a beautiful candle. Make a few of these so that you're comfortable with the techniques involved, before trying your hand at more complicated styles. Get the water bath ready: Fill the candle mold with water and place in the pail. Pour enough cool water into the pail to reach about one-half inch from the top of the mold. Remove the mold and dry thoroughly. Lightly coat the inside of the mold with silicone spray. Measure and cut the wax. You'll need enough to fill the candle mold to the desired height of your finished hurricane candle. Melt the wax in the double boiler. When the wax is smooth and completely melted, add a hint of color if desired and stir gently to combine. Pour the melted wax into the candle mold. Using tongs and oven mitts, carefully lift the mold and place it gently into the water bath, taking care not to splash any water into the mold. You may need to weigh the mold down to keep it sitting flat in the water bath - you can do this with any heavy household items, such as inverted dinner plates. Allow the filled mold to sit in the water bath. The wax will start to harden from the outside inwards. Wait until the thickness of this hardened wax is about half an inch around the entire inner wall of the mold. Remove the mold from the water bath and quickly but carefully pour the remaining melted wax back into your melting pot. Allow the wax shell in the mold to cool completely before removing it from the mold. Use care when taking the hurricane shell out of the mold, as the wax could be fairly brittle. Level the top rim of the candle by using a hot spoon or vegetable peeler. To use your hurricane candle, place a clear glass votive holder containing a votive candle inside. Light with a candle lighter. Adding a photo - Candle Tech has a great tutorial for embedding photos in candles. Autumn leaves candle - The techniques used to make this hurricane candle can be adapted to incorporate other materials such as dried flowers, glass beads, or fabric scraps. Chunk wax candle shell - This is a different way to make hurricane candles, with chunks of colored wax. The finished hurricane candles can be used indoors or outside, since the shell will protect the votive candle from the breeze. Using several hurricane candles together to line a pathway or decorate a table can make a beautiful presentation. They also make great gifts!